New Full-Length and First Concept Album from Judas Priest! 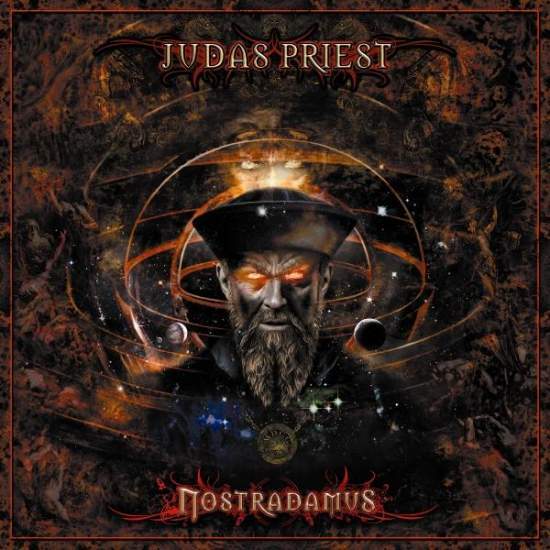 Nostradamus is a concept album by English heavy metal band Judas Priest, focusing on the 16th century prophet Nostradamus. The band’s first concept album, it was originally intended to be released in late 2006 before being pushed to a 2007 release, and was released on June 16th 2008 on Epic records. Guitarist K.K. Downing revealed in a February 2007 interview with Brave Words & Bloody Knuckles that 18 tracks had been recorded with a total length of more than 90 minutes and that there was not much he would like to cut down. In November 2007, singer Rob Halford indicated that it was still undecided whether it would be a double-disc set or not. In April 2008, it was confirmed that the album would be released as a double-CD/triple vinyl LP. Musically, the album contains symphonic orchestrations including the use of keyboards and choirs which is unlike anything the band has previously attempted before. In November 2007 the band began mixing the album. During its summer 2008 tour, the band plans to include shows where the album is performed in its entirety. According to Billboard.com, the album was released in Europe on June 16, 2008 and June 17 in United States. Three configurations of Nostradamus have been issued. The most common is a regular jewel-cased double CD, but there is also be a “CD deluxe hardbound version,” which features a 48-page booklet, while a “super deluxe version” includes three vinyl records (in addition to the CD deluxe packaging, plus a poster). Nostradamus centres around the life and times of the prophet. The first disc details various prophecies he has about the future and the end of the world. This leads to him being exiled. Later on, after his death, the world realizes just how right he was.